Lynn Susholtz is an artist, community activist, educator and founder of Art Produce and Stone Paper Scissors, public art/education studio. Her art practice has a participatory, social engagement/community collaboration focus. Recent public projects include digital video documentary and crowd sourced interactive installations. An advocate for increased access to arts and culture, Lynn works locally to develop educational, social and environmental resources for youth and families. Engaging youth and adults in the process of creative problem-solving, she teaches classes and workshops throughout the county in schools, cultural centers and at her Stone Paper Scissors studio. She has been a California Arts Council, Artist in Residence, and is an arts education consultant for UCSD’s Education Studies Department and the San Diego Unified School District. Lynn’s public art commissions range from the design of educational playgrounds and school campuses to sculptural video installations. She has exhibited her work at the Athenaeum Arts and Music Library, City Gallery at San Diego City College, Mesa College Art Gallery and was selected the State Assembly District 39 representative for the “California Contemporary Artists 2007” exhibit at the State Capitol in Sacramento. Some of her community engagement work at Art Produce was featured in 2012 issue of Public Art Review, "Food For Thought". Lynn co-authored a resource book for teachers, “Object Lessons, Teaching Math Through Visual Art”, and "Community Development in the Context of Art: North Park and the Citizen Artist" for CultureWork Broadside documenting her history of community activism and the development of Art Produce. Check out Lynn's interview with Monkeywrench which was broadcast on January 16, 2018 where she discusses artists in communities and being a Citizen Artist. Monkeywrench is a radio program aired on KUCI 88.9 FM in Irvine, UC Irvine's independent, underground radio station. CLICK HERE to listen. To see Lynn's newest public project, You Are Home, CLICK HERE. ​Nikki Dunnan is a dancer, teacher, and administrator. Nikki co-founded Eveoke Dance Theatre in 1994 as one of 8 original Concert Company dancers under the direction of Founding Artistic Director, Gina Angelique. She was featured in 32+ original dance theatre works (month-long runs) in her 18-year career with the Company. She became the Administrative Director of Eveoke in 2000 and ran the organization as Executive Director from 2007-2012. Since her departure from Eveoke in 2012, Nikki has worked as a bookkeeping and administrative consultant for several small businesses. She is also a guest artist at Canyon Crest Academy, teaching in the day classes and occasionally working with the conservatory dance program. Nikki has a degree in Psychology from the University of California, San Diego. ​Nikki stepped into the Administrative Director role of Art Produce in February 2016 and looks forward to the continued expansion of the organization’s programming and community impact. Felicia Douglis is President of FRD Solutions, LLC, a firm that provides organizational and workforce performance strategies and solutions for clients using a combination of predictive analytics, design thinking, and technology. Her professional experience includes designing and delivering learning transformation initiatives, and execution of large-scale training programs for clients across a variety of industries, including Federal agencies, US Navy, and commercial organizations. Felicia holds a B.A. in Studio Arts, an M.Ed in Educational Technology, and will complete her M.S. in Predictive Analytics from Northwestern University in June 2018. Carrie is the owner of See Spot Sit, a pet sitting and dog walking company that has served San Diego since 2000. She has a degree from San Diego State University in liberal studies and child development. Gail Goldman is the principal of Gail M. Goldman Associates (GMGA), a public art planning, policy development, and project management consulting firm with clients in San Diego County and throughout the United States in both the public and private sectors. Prior to founding GMGA in 2000, Gail was the Public Art Director for the City of San Diego Commission for Arts and Culture and the Director of Art in Public Places and Individual Artist Fellowships for the Colorado Council on the Arts and Humanities. Gail holds a Bachelor of Fine Arts in metalsmithing from Syracuse University. Caren Holtzman is faculty in UCSD’s Department of Education Studies. She teaches a range of EDS classes, including service-learning courses, practicum classes for the EDS minor, and methods classes (math and arts) for the multiple subjects/M.Ed. students. Caren directs the Partners At Learning (PAL) Program, the largest service-learning program at UCSD. She is also the Director of UCSD’s Artsbridge Program. Caren has worked as an education consultant throughout San Diego County and across the country. She has co-authored several teacher resource books and has also written children’s books. Richard Keely is an artist and educator from Southern California. Originally trained as a painter, Keely’s work during the last twenty years has turned towards sculpture, photography and installation. With the sculptural work Keely is often concerned with transforming ordinary objects into visually dense wall pieces that have the potential to evoke an array of experiential possibilities. Richard has exhibited his work and given lectures at several well-known Universities and has been a “Visiting Artist” at Murray State University, Oberlin College and Montana State University. Currently Richard Keely is living in San Diego, CA. and is an Associate Professor of Art at San Diego State University, where he teaches sculpture for the School of Art and Design. Molly is the Executive Director of Malashock Dance and brings experience in program management, development, and administration to her position. As Education Director from 2009 – 2014, she was responsible for all aspects of the School and in-reach/outreach programs. She has strategically aligned specific synergies between the artistic and educational pillars in order to create a holistic approach to the relationship between MD’s programs, the community it serves, and its funders. A modern dancer and instructor with training in various dance genres, Molly demonstrates uncompromising dedication to both students and the art form of dance. Molly is an active member of several arts education advocacy groups, and continues to give back to the arts community through service on the Steering Committee for San Diego Dance Connect from 2014-2016, as a member of the Advisory Board for A Step Beyond and the Board of Directors for Art Produce. ​Pamela Richards consults with San Diego area non-profits, helping them evaluate which of their programs are effective - and why. She is an avid San Diego arts supporter, including work as a board member for Cygnet Theatre and Eveoke Dance Theatre. Before she moved to San Diego, she was a sociology professor at the University of Florida and has a Ph.D. in sociology from Northwestern University. 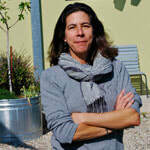 Leslie Ryan is a Registered Landscape Architect in CA. Her award-winning work focuses on ecological design, environmental and social sustainability, and includes designs for habitat and water conservation, urban food production, and affordable housing. Leslie is writing a Ph.D. dissertation at Oregon State University on art and science interactions; she received a Master of Environmental Design degree from Yale University (2006) and a B.S. in Landscape Architecture from California Polytechnic University, San Luis Obispo (1988). Leslie is the recipient of the Rome Prize in Landscape Architecture (1995), and was a visiting professor of landscape architecture at the University of Oregon 2006-08 and 2013-17. Her writings on relationships between art and land use practices have been published in Places journal and the Journal of Environmental Philosophy.